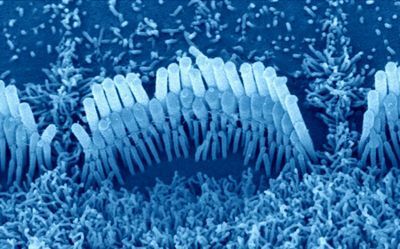 Scientists have been looking for years for the proteins that convert the mechanical movement of inner ears’ hair cells into an electrical signal that the brain interprets as sound. In a study published today (August 22) in Neuron, researchers have confirmed that transmembrane channel-like protein 1 (TMC1) contributes to the pore of the so-called mechanotransduction channel in the cells’ membrane. This was really the smoking-gun evidence because if you change the properties of currents flowing through a protein, it must be forming a channel. 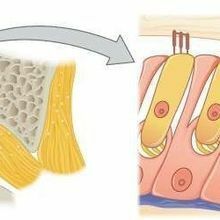 When a sound wave enters the cochlea, it wiggles protrusions called stereocilia on both outer hair cells, which amplify the signals, and inner hair cells, which convert the mechanical signals to electric ones and send them to the brain. It’s been tricky to figure out what protein the inner hair cells use for this conversion, because their delicate environment is difficult to recreate in vitro in order to test candidate channel proteins. 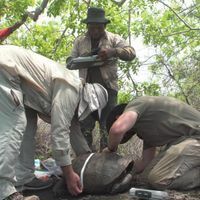 In 2000, researchers reported on a promising candidate in flies, but it turned out not to be conserved in mammals. In a study published in 2011, Jeffrey Holt of Harvard Medical School and Boston Children’s Hospital and colleagues showed that genes for TMC proteins were necessary for mechanotransduction in mice. 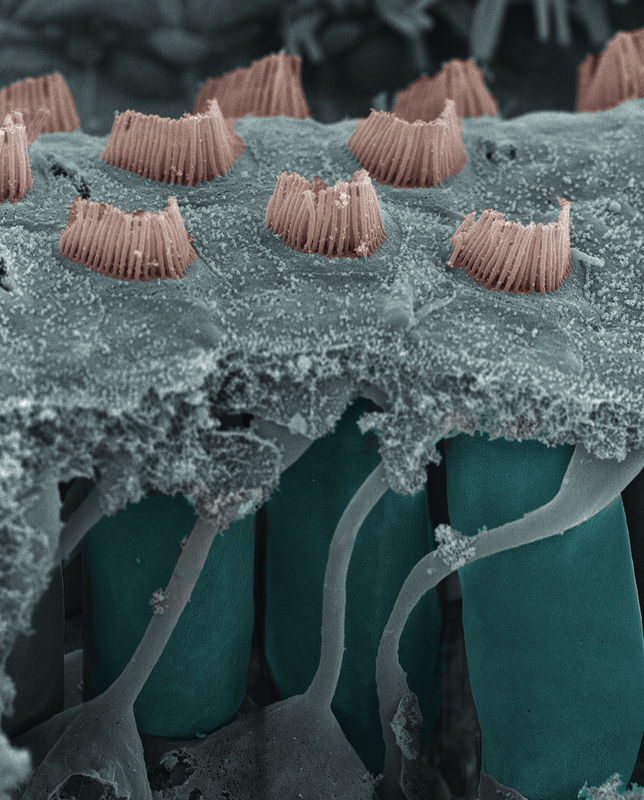 This evidence—combined with earlier work from another group showing that mutations in these genes could cause deafness in humans—pointed to the idea that TMC1 formed the ion channel in inner ear hair cells. To investigate the protein’s role, Holt and colleagues created 17 different Tmc1 genetic mutants, based on the loci’s known role in deafness or their location in the structure of TMC1 that they propose in the study. Each sequence alteration changed the endogenous amino acid to cysteine. 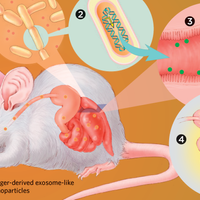 The authors next injected an adenoviral vector carrying either the wildtype gene or one of the 17 mutated versions into the ears of mouse pups lacking the gene entirely. Four or five days later, they removed the hearing organs from the ears of the mice and cultured them for another three to 13 days. While in culture, the researchers made electrophysiological measurements of currents in the hair cells to test the transduction potential of the mutated TMC1 proteins. They also measured currents in the presence of a drug that causes cysteine to form a disulfide bridge, likely affecting the shape of the TMC1 protein. 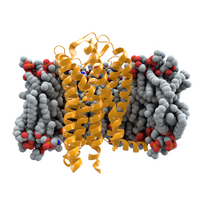 In 11 of the 17 mutated proteins, the drug changed the amplitude of the current they recorded. The study “is definitely compelling evidence that the TMCs are the pore-forming subunits,” Teresa Nicolson, a neuroscientist at Oregon Health & Science University who did not participate in the work, tells The Scientist. “Our work in zebrafish keeps leading us to the same conclusion that TMCs are key to mechanotransduction,” she adds. According to Peng, there are plenty of open questions, namely, how the TMCs are structured and how they are actually activated and function during mechanotransduction. He adds that there are other proteins important for mechanotransduction, too, and understanding “how those are acting in this complex” will be another future direction. B. Pan et al., “TMC1 forms the pore of mechanosensory transduction channels in vertebrate inner ear hair cells,” Neuron, doi:10.1016/j.neuron.2018.07.033, 2018.